Just letting all my friends, family and FOLLOWERS know that I HAVE MOVED! My NEW Blog is called, "Jeans and Slippers Creations" and I would love it if you followed me there! Colorful Creations Blog Hop ~ Day 3!! Welcome to Day 3 of the Colorful Creations "Jingle All The Way" Blog Hop! We hope that you enjoyed the recipes and fun projects and ideas that we shared on Days 1 and 2. We are so happy to have you back again today! Today's first stop in the Blog lineup is Brandi's Blog. So far she has shared with us a cute set of holiday drawers and a really pretty tag. Wonder what she has in store for us today! You should have arrived here from Paula's Blog. Be sure that you have visited each blog every day and leave a comment because a random winner will be selected to win a wonderful Grand Prize of Scrappy Goodies! So fun to make! Really! I started by cutting a 2" and a 1 1/2" of pp, around 12-16" long. The length may vary... depending on how your want your rosette to have more or less pleats/folds. I used a border punch along the edge of each strip, but you don't have to. I then scored every 1/4" or less along each strip and began folding along each line, like an accordion. The ends were adhered together. Now you can create your rosette. Flatten it down and gently bring the inner circle together. There are different ways to do this... but I like to cut a small circle and adhere it to the circle. Hot glue is what works best for me. Two rosettes of different sizes were layered for a cool dimensional look. Now... it's time to embellish! I added some home made bling, ribbon and a vinyl shape with a glitter gem in the center. Ribbon was threaded through one of the holes at the top of the rosette. Hope I've inspired you to give it a try too! You're next stop is at Laine's Blog. Be sure to check out what she has in store for you. Be sure to check back at the Colorful Creations site tomorrow for all new December monthly challenges from our wonderful Design Team! You won't want to miss it! There's such a variety of challenges and I'm sure some of them are going to inspire you! I have a Money Card to share with you today that was submitted at Colorful Creations for the "Jingle All The Way" Blog Hop. If you haven't stopped by already, I hope you do! There's lots of inspiration, recipes and fun challenges... as well as chances to win prizes along the way... and a Grand Prize will also be offered by commenting and completing all the challenges. And, if you have stopped by and hopped along, I hope you're enjoying all your stops along the way! So, this money card was created for Brandi's "Anything But A Card Challenge" which is being offered on her blog. You have until Dec 5th to complete the challenges. To get to the Colorful Creations Blog Hop... just click HERE. This was so fun to make! In the center of the wreath, I added a metal snowman. Glitter gems follow the curve of the flap and a row of bling was added at the top. Here's a closer look at the wreath and snowman embellie. The glitter gems and bling at the top. Here's the card opened. Just tuck money inside... doesn't get easier that that! And... one more angle on the card. Thanks so much for stopping by and I hope you will Hop along with us and have some fun! Welcome to the Colorful Creations "Jingle All The Way" Holiday Hop ~ Day 2!! If you have problems while here... I am truly sorry! Please bare with me! So... now onto Day 2 of our Hop! 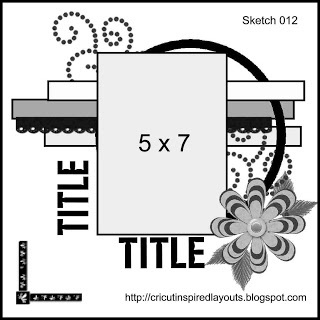 I have a sketch challenge for you today. The criteria: To use a Christmas photo. Simply use this sketch and add a Christmas photo... and you're in the Challenge! This is the layout I created titled, "Oh Christmas Tree." This is our tree taken several years ago. I always love to look at the lights and the hundreds of ornaments that take me forever to add on the tree! But the end result is so pretty! A cluster of gold poinsettia were added at the lower corner of the photo. Swirly bling flows from the flowers under the photo. The page title was tucked under the punched border and three tiny glitter foam stockings were added below the title... with tiny bows added at the top of each one. The circle was cut from felt. A bit tricky to shape back into a circle... but I got it after awhile. Three glitter gems were added onto the felt circle at the corner of the photo. Glitter tape adds just a little more bling to the page. And... more swirly white bling bursts from the flowers. More bling was added above the photo. A closer look at the felt circle and bling. I hope you enjoyed my layout and I inspired you to start creating! After completing your layout, add it to the Colorful Creations Gallery using the tag: BHCPhoto. To be eligible for the prize, complete the above challenge by December 5th. You MUST become a follower of my Blog AND leave a comment in this thread to let me know you're hopping along! The winner of this challenge will be announced HERE on December 6th... so be sure to check back. You will have 7 days to contact me and claim your prize. After 7 days, your prize will be forfeited and another name will be drawn. If your name was chosen, please email me at: pbllib(at)myfairpoint(dot)net. Hope to see your layouts in the Gallery! Become a member of ALL our blogs and leave a comment daily for a chance to win an AWESOME Grand Prize of scrapping goodies! Winner of the Grand Prize will be selected from members that comment daily AND complete all of the challenges by Thursday, December 5, 2013 - 11:45 pm. Remember, individual prizes will be announced on each member's blog. And, the Grand Prize winner will be announced on the Colorful Creations site on Friday, December 6, 2013. I hope you are enjoying all the Holiday Inspirations and they help you to get some of those projects completed for Christmas, some new recipes to try and maybe even get a few scrapping projects completed too! Come Hop With Us at Colorful Creations!! 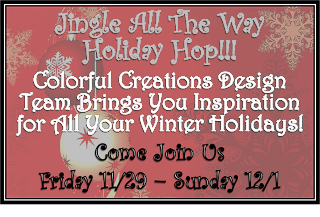 Welcome to the Colorful Creations Design Team "Jingle All The Way" Holiday Blog Hop! We hope that you are ready for THREE days of fun, challenges, recipes and other holiday inspiration to get you on your way to a state of Holiday bliss (or at least on the right path)!! By now, you have enjoyed your Thanksgiving Dinner, football games, parades and of course, Black Friday "wee hours of the morning" shopping trips and are ready to sit back and relax with us. I am the first stop for the Hop. Woo hoo! If you would like to get back to Colorful Creations and the Hop information, just click here. Today I will be sharing an inspirational card that I made especially for you as well as a yummy Christmas recipe. There are lots of layers and a fun snowman in the center. A candy cane is tucked between the ribbon and twine bows. The green cardstock was distressed along the edges and a large snowflake was added behind the cute little snowman tag. The card at a different angle to see the dimension. And a closer look at the cute snowman, ribbon, twine and candy cane. At the very top of the card I added two silver glitter gems. Become a member of all our Blogs and leave a comment daily for a chance to win a fabulous Grand Prize of scrappy goodies (Photo to be posted later at C.C. site). Just let me say that it will be a fabulous mixture of goodies! The winner of the Grand Prize will be selected from members that comment daily and complete all of the challenges by Thursday, December 5, 2013, 11:45 p.m. The Grand Prize will be announced on the Colorful Creations site on Friday, December 6, 2013. Our individual prizes will be announced on each member's Blog. So be sure to check back! Now... here's a yummy recipe to share with you. 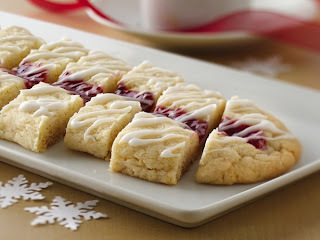 Maybe you can add this to your list of goodies to make for Christmas each year! Total Prep Time: 20 mins. Bake: 20 mins. + cooling. 1. In a large bowl, cream butter and sugar until light and fluffy. Beat in egg and vanilla. Combine the flour, baking powder and salt; gradually add to creamed mixture and mix well. 2. Divide dough into four portions; shape each into a 10-in. x 2 1/2 in. log. Place 4 in. apart on greased or foil-lined baking sheets. Make a 1/2 in. depression down the center of each log. 4. In a small bowl, combine glaze ingredients. Drizzle over warm cookies. Cool completely. I hope you enjoyed my Christmas card and recipe. Now hop on over to Brandi's Blog to see what she has in store for you. Below is our lineup list in case you get lost along the way. Be sure to check back tomorrow for a challenge & prize to be offered! 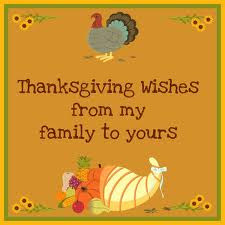 Hope you have a fabulous day with family and friends!